Eric, I’ve been meaning to comment here but it kept slipping away from me. First, thank you for working to clarify that Calvinism is not the odious doctrine some make it out to be. I’ve been a moderate Calvinists for many years now as I am convicted by scripture that the teaching is consistent (still struggle with “L”). I’m fairly Reformed in my theology and lately have been exploring the PCA for a possible church move. Now here is what I’ve found interesting. For the couple of churches that I have visited recently, I have found the people much more friendly and welcoming than the bible church I have been with these past 4 years in Dallas. So I think its kind of odd to say that just because of the doctrine of TULIP that people must be cold. I have not found that to be the case, at all. I do interact with a number of solidly Reformed people on-line and think discussions can seem devoid of personality. But that is because of the high view of scripture and doctrine that is upheld, I think, and should not necessarily be construed as unloving. Though some can be dismissive in discussion. Yes, Calvinism is misunderstood by many, the reason is, its not in the pages of Bible. There was a very good article on this false teachings in “The Sword of the Lord” in the past few months. I would suggest anyone following this teachings to read it while following along with their Bible open. I’m not going to debate this issue right here, just wanted to make a suggestion. Please send me a link for The Sword of the Lord articles. As for the Sword of the Lord & the articles about Calvinism I suppose you would have to subscribe to it so that you could read online back issues. And or find the dates it ran & borrow them from a person that subscribes & saves them. Comments on seeing people as unloving. Might I remind all, sometimes we humans consider a person as unloving simply because they disagree with us & stand solid on what they believe. And of course if your church happens to be of the Calvinism persuasion, which I am not, & someone was visiting that did not hold to that view while openly expressing & defending their belief, they just might see some members of your church as acting unloving. For some members of your church may see that person as a trouble maker causing division. After services some members may not approach that person trying to make them feel welcome & inviting them to come visit them again. I had a pastor friend called to preach at & out of town church one Sunday. Little did he know that many of them were of Calvinism persuasion. After the morning preaching services they were very cold to him. After many had left one member of this church clued him in on why he had gotten the cold shoulder treatment. Wow. As a fellow Calvinist I wanted to say thank you for posting this. I have so many thoughts (having had a couple of similar posts on my facebook) but here are a few….. There have been several people that I have had to go back to in order to repent and ask forgiveness of because of the way I treated them when I first discovered the Reformed tradition. This needs to happen more often for some of us. The Doctrines of Grace when rightly understood, do nothing but produce depths of humility an d heights of praise. Those of us that are farther along in our understanding of those doctrines must do all we can to educate those who are younger to the reformed faith and those who are younger should be careful not to swing their theology at the end of a rope seeking whom they can bludgeon. For some, it become more about furthering the kingdom of “Calvanism” than the Kingdom of God. Whether you hold this theology or not, our unity is in Christ and Christ alone. It is ironic that what started out as a post about unity, revealed the sin nature that when allowed to run rampant will attempt to tear the Body apart. Thank you for the kind words. Blessings! Great post from Rev. Eric C. Redmond, Pastoral Assistant and Bible Professor in Residence at New Canaan Baptist Church, Washington, DC. Some churches may be friendlier and more loving than other churches, but I’m not so sure it is their theology that dictates that. I wouldn’t need a year to see that Calvinism is in error (per Scripture) with regard to ‘limited atonement’. They get a lot right. But that’s one where they surely are mistaken. In your guide to people struggling with the truth of Calvinism you forgot to encourage them to pray. 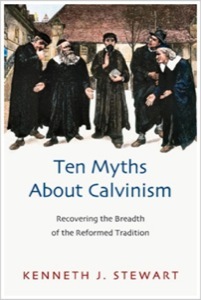 Calvinism is “strong meat” food that even mature, godly Christians struggle with. Urge people to pray and ask God to open their eyes. The Spirit will guide strugglers into the truth in His way, and at His time. Thanks, Tim! How right you are! Blessings!